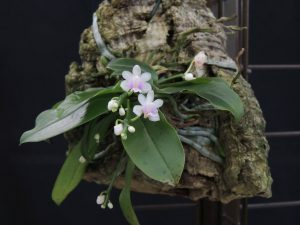 This tiny flowered Phalaenopsis is one that we have seen growing in Sikkim in hot valleys in seasonally dry forests where it lives in shade and develops an extensive root system. In the wild the plant is semi deciduous but it keeps its leaves in cultivation. The species is found from Sikkim right across the Eastern Himalayas to South East Asia, Malaysia and the Philippines. We find that plants enjoy growing mounted which also shows of the very pretty little flowers on short spikes that last a long time. We grow plants in shade in Warm Asia (min 18C).